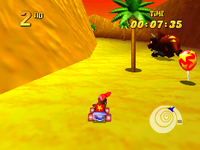 Tricky's Course is the first boss course of Diddy Kong Racing and its remake Diddy Kong Racing DS. It is where the player races against Tricky the Triceratops, hence its name. It located in Dino Domain, which itself is part of Timber's Island. The boss of this course is Tricky the Triceratops. Tricky's Course is located in a desert valley. The player races Tricky up a tall, spiral-shaped mountain. Around halfway up the mountain, which cuts directly through to the other side and even contains a Zipper. At the very top, there is a Sphinx-like structure resembling a triceratops and the finish line. After completing the Silver Coin challenges, the player must rematch Tricky to a race. The rematch is more difficult as Tricky races faster than the previous race. There are also collapsing pillars and rolling boulders and rocks spinning down the course. In the Nintendo DS remake, the shortcut no longer exists although the course is generally easier. An optional third challenge involves using the Stylus on the touch screen to race.